The Wiyot Tribe hosts Wiyot Day annually to provide an opportunity for the whole community to come together and celebrate Wiyot Culture, honor our elders, and veterans. 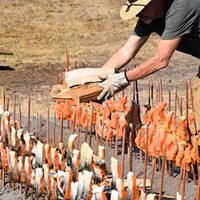 The event is held at Table Bluff Reservation in Loleta California, features dance and cultural demonstrations, a Stick Game, Card Game Tournament, live music, games for kids and vendors. The Tribe will be serving dinner at 5:30 pm for $10.